Margot Robbie shared this photo in costume as Sharon Tate. MARGOT Robbie has given Instagram followers a first look at her dressed as Sharon Tate for Quentin Tarantino's upcoming film, Once Upon a Time in Hollywood, and the result is uncanny. In the photo, the Aussie actress wears a white skirt, black turtleneck and white boots as she stares into the camera, with her blond locks draping down her sweater. "First look. #OnceUponATimeInHollywood @onceinhollywood," she captioned the picture. Robbie will play Sharon Tate, an actress and model who had a successful career in the 1960s. Tate was married to director Roman Polanski but was murdered by members of the Manson family in 1969 when she was eight-and-a-half months pregnant with her first child. Tarantino's new movie also stars Brad Pitt and Leonardo DiCaprio. DiCaprio plays Rick Dalton, the former star of a western TV series, while Pitt portrays Cliff Booth, his longtime stunt double. Tarantino describes the film as taking place in "Los Angeles in 1969, at the height of hippie Hollywood." Tate's sister, Debra Tate, initially spoke out against the forthcoming film, but recently tweeted that she gave the famous director her blessing after reading the script. #Tarantino movie people think they know what this movie is, they don’t I’m grateful to Quentin For letting me read the script, and sitting down with me to explain his vision. "#Tarantino movie people think they know what this movie is, they don't I'm grateful to Quentin for letting me read the script, and sitting down with me to explain his vision," she wrote, adding, "I have to protect my sisters legacy and to do what I can to make sure her memory is not exploited. I have to protect my sisters legacy and to do what I can to make sure her memory is not exploited. I can honestly say that Quinton shares my commitment. I’m proud to fully support his film. "I can honestly say that Quinton shares my commitment. I'm proud to fully support his film." 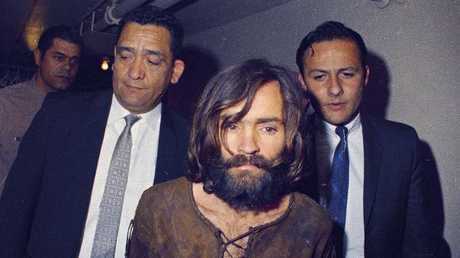 Charles Manson being escorted to his arraignment on conspiracy-murder charges in connection with the Sharon Tate murder case in 1969.